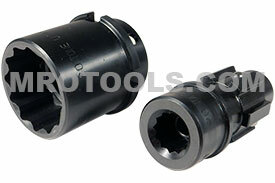 TONE 7/8'' Standard Length Inner and Outer 2 Piece Socket Set designed for use on TONE S-61EZ Electric Shear Wrench. The tool does all the work. 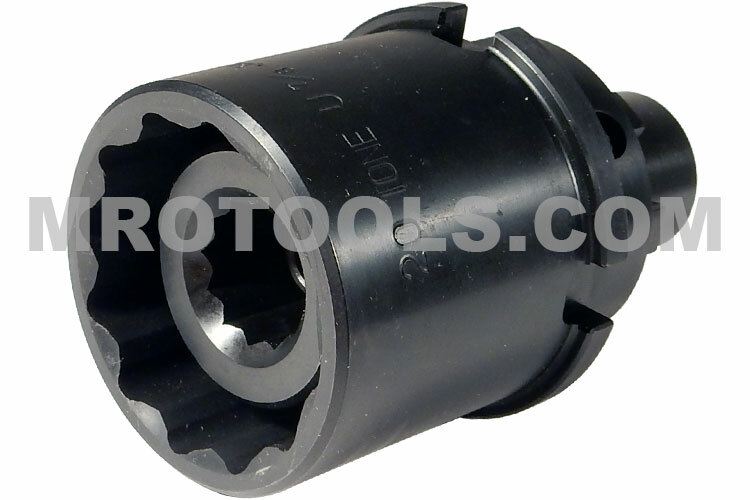 As the outer socket rotates clockwise tightening the nut, the inner portion of the tool grips the spline at the end of the bolt to keep the bolt from turning, and to provide the reaction torque. (The operator is not using his strength to tighten the nut.) As the nut tightens, the torque inside the tool increases until it reaches the designed shear strength, and the end of the bolt shears (twists) off. Clamping loads are correct, inspectable, and repeatable. S60EZ01-02 TONE 5/8'' Standard Length Inner and Outer 2 Piece Socket Set designed for use on TONE S-61EZ Electric Shear Wrench. 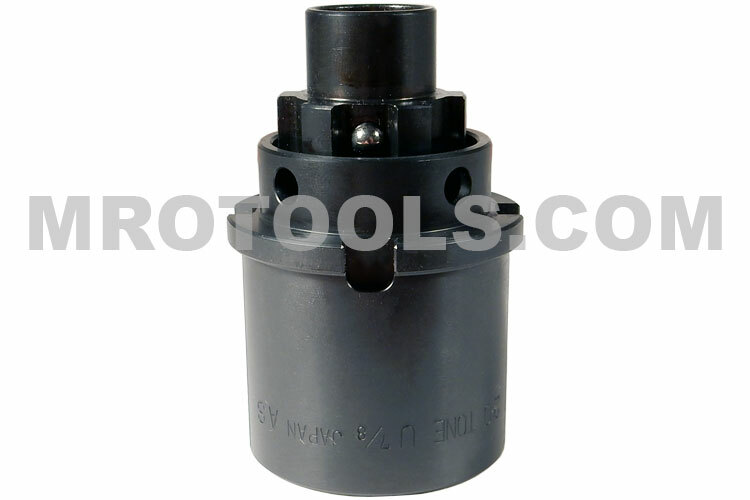 S60EZ03-04 TONE 3/4'' Standard Length Inner and Outer 2 Piece Socket Set designed for use on TONE S-61EZ Electric Shear Wrench. S60EZ05-06 TONE 7/8'' Standard Length Inner and Outer 2 Piece Socket Set designed for use on TONE S-61EZ Electric Shear Wrench. The S60EZ05-06 TONE 7/8'' Inner/Outer Socket Set (For S-61EZ Shear Wrench) is one of thousands of quality tooling products available from MRO Tools. Please browse TONE Electric Shear Wrenches for tools similar to the S60EZ05-06 TONE 7/8'' Inner/Outer Socket Set (For S-61EZ Shear Wrench). 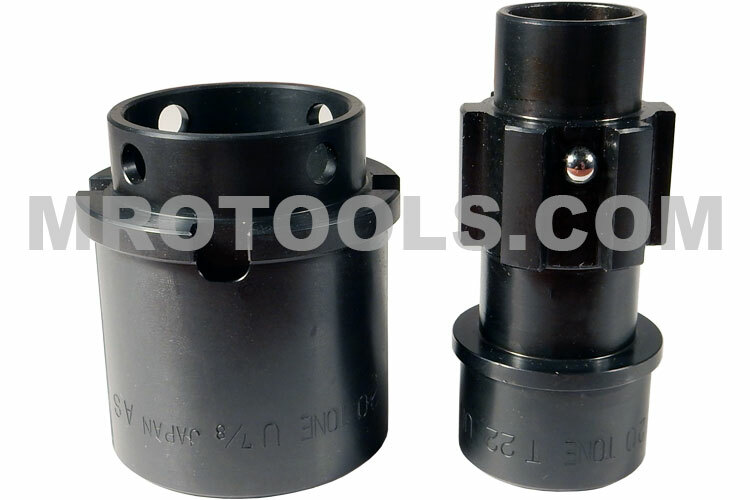 S60EZ05-06 TONE 7/8'' Inner/Outer Socket Set (For S-61EZ Shear Wrench) description summary: S60EZ05-06 TONE 7/8'' Standard Length Inner and Outer 2 Piece Socket Set designed for use on TONE S-61EZ Electric Shear Wrench. Quantity discounts may be available for the S60EZ05-06 TONE 7/8'' Inner/Outer Socket Set (For S-61EZ Shear Wrench). Please contact MRO Tools for details.